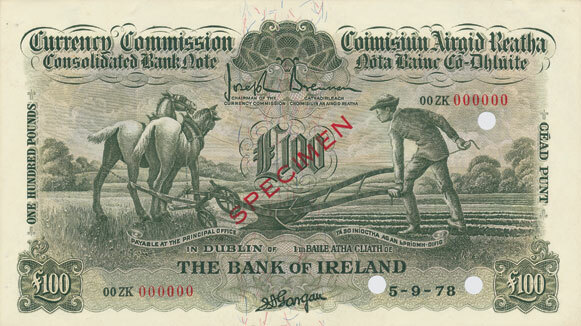 Consolidated Bank Notes, colloquially known as Ploughman banknotes were issued from 1929 to 1941 as a direct replacement for the notes in circulation of the commercial banks operating within the Irish Free State. 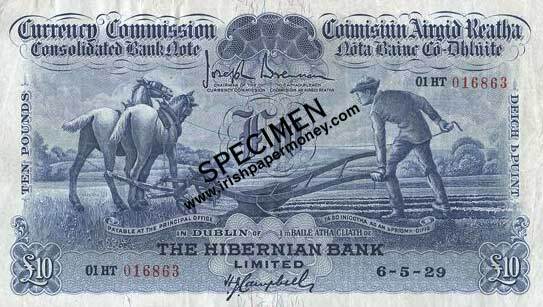 They served as an interim measure to wind up the banks' note issues as the A Series (Lavery) notes were brought int circulation. 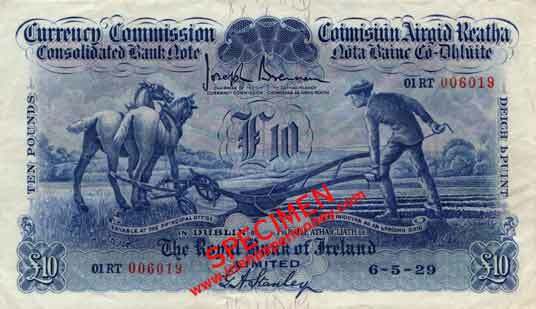 The Currency Commission Ireland was the overall Issuing Authority for both the Lavery notes and the Ploughman notes. 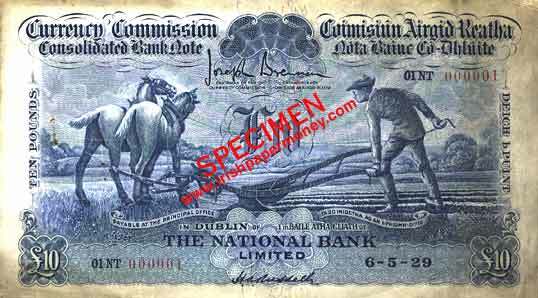 Ireland consolidated banknotes: all eight commercial banks in the state issued the Ploughman notes. 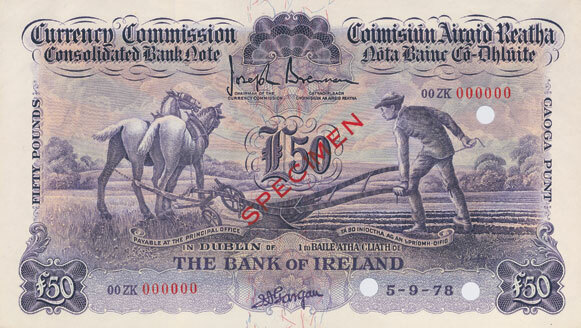 The reverse of the Ploughman Ten Pound has the then Currency Commission building, in Foster Place, Dublin, just off College Green. 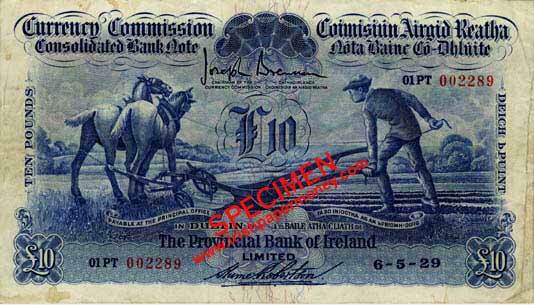 Ploughman One Pound reverse features the Customs House, Dublin. Ploughman five Pound reverse features the bridge over the River Lee, Cork city. 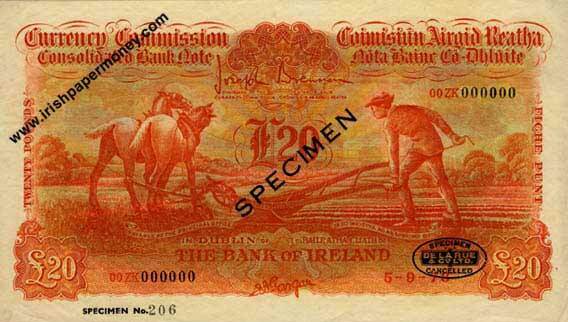 Ploughman Twenty Pound reverse features the Rock of Cashel, Co. Tiperary. Ploughman Fifty Pound reverse features Croagh Patrick mountain, Co. Mayo. Ploughman One Hundred Pound reverse features Killiney Bay, Co. Dublin. A De La Rue printer's Specimen Ploughman £20, printed on non-watermarked paper. It was probably printed in the 1930s as an example of the company's work. It was in a book of specimens of TDLR banknotes. There's a few sets of these around. Nice. 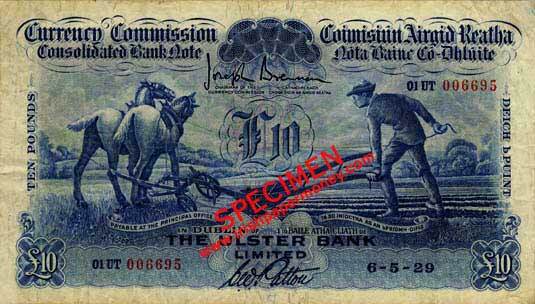 A pre-production proof Ploughman hundred Pound note in blue, probably printed sometime before 1929. Edit: Other proofs are in the Ploughman Specimen section of the main web site. Those non-standard colour specimens are interesting. I wonder how many colour variants exist for the various denominations? I attach a blue £1 specimen with nice eye appeal that was offered recently at a public auction. This is a very nice note. As far as I know, all the denominations were tested with all the colour combinations. I believe that the TDLR Ploughman specimens were only done in the colours that we've seen them in. I must add this Pound to the website. Got a scan of the reverse too by any chance? Interesting to hear that there may be other colour variations. Unfortunately, I do not have a scan of the reverse. Someone out there may be able to provide one ! Found it! The reverse of the blue Ploughman Pound is an interesting variation on the usual green. 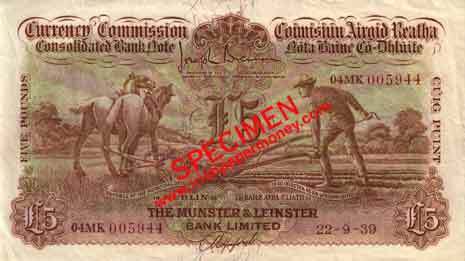 The highest number recorded for the Munster & Leinster £5 note. 04MK prefix. This note was part of the Extraordinary issue. 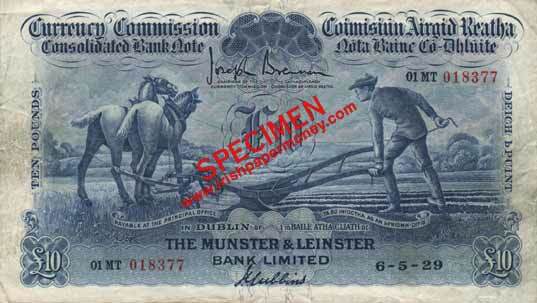 Munster and Leinster Bank Plowman 5 Pounds. 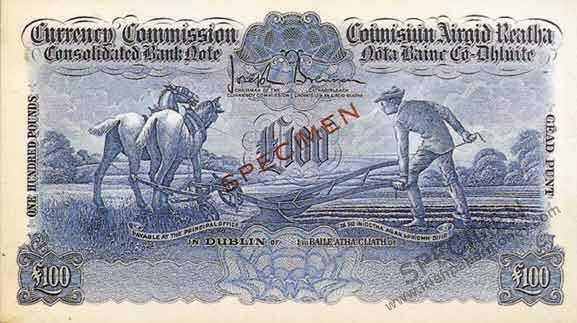 A Currency Commission Specimen Ploughman 50 Pound, produced at the time of first print run, ca 1929. Same colours as on the standard issue note. Ploughman 100 Pound note specimen, in the colours of the standard issue notes. 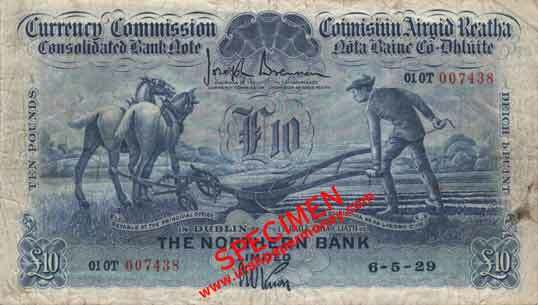 The full set of Plowman specimen set is on the Currency Commission Consolidated notes section in the main web site.